"From there everything has changed, our family has never been the same. My son was everything to us, a cheerful boy with no evil heart, studious and full of dreams, "said his father, excited. Obeidallah said that his son was not throwing stones at Israeli soldiers or had any attitude to justify firing. Aboud died without knowing the reason and became, for the inhabitants of the field, symbol of the fight for the peace, wanted for decades. 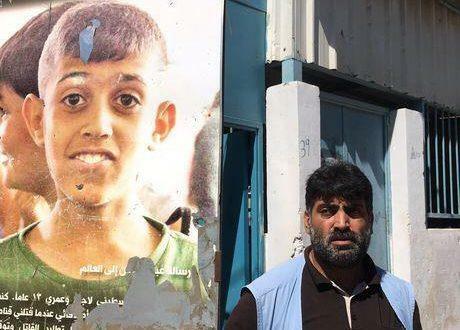 In a poster at the entrance to Aida Camp, in front of the UNRWA office where the crime took place is a poster with the photograph of Aboud and the following message: "My name is Aboud Shadi, a Palestinian refugee of thirteen years. I was right here, standing with my friends, when an Israeli sniper shot me dead. My soul will stay here, chase the killer, and motivate my classmates. I question whether the international community will bring justice to Palestinian children. " At the time of the crime, Israel stated that the shooting was not intentional and that the target was an adult who organized frequent protests and was close to the child at the time of the shooting. So far he has not heard any kind of punishment for the sniper. "In this war, punishment for this kind of common crime here practically does not exist. We have no one to turn to. Unfortunately we had to accept and live with this pain that will be eternal. Worse, if you watch the poster with my son's photo is full of gunshots, it means that it was intentional and there was not any kind of regret, "concluded the father. For decades, Aida's Palestinian refugee camp was one of the main targets of Israeli troops - mainly because it was close to the 750-kilometer wall built by Israel to restrict the entry of Palestinians into Jerusalem. Another strong motive would be because Bethlehem, according to the Bible, is exactly where Jesus Christ was born - and the Israelis also consider the city as sacred. Almost a year ago, Israel has given a truce and the field is hardly in conflict. Despite this, the family of little Aboud still lives with fear and everyone is traumatized. "We have a dream of returning to where our families were born, but if this is not possible we will live here, because it is in this place that we have our son's memories. I get worried every day when my kids go out to school, but we have no other choice. " Coincidentally, Obeidallah has been working for three years in the UNRWA office, exactly. He does general services and with that money supports the whole family. "There is no way we can bring our son back, but we have to keep fighting and trying to live life in the best possible way. I only hope that my other children will finish their studies and have a bright future, and especially in peace. And if it is possible to return to our land, we will return, "he concluded.